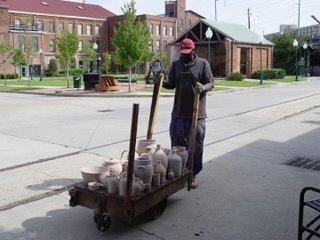 Groundhog kiln fires first load of pottery! 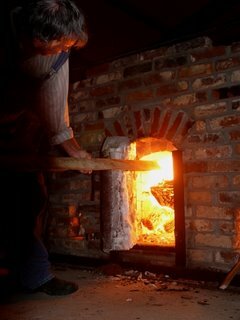 After one and a half years of construction and trials, the groundhog kiln at Enterprise Mill in Augusta, GA has produced its first successful firing! 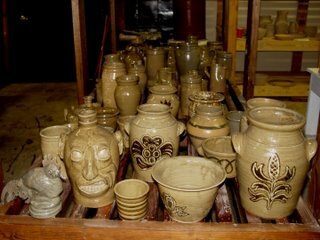 Old Canal Pottery has seemed more of a dream than any business that would ever materialize. You can’t imagine the joy felt after such a long journey filled with every imagineable obstacle and countless hours of hard toil! My partner, Gene Gilbert and I, Gary Dexter would like to thank the many individuals and businesses who’ve helped us get to this exciting start…without their help, it would have been even more difficult or impossible. We are compiling a mailing list for all of the lovers of southern alkaline or “ash” glazed pottery. 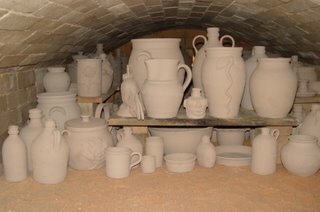 If you would like advanced notice to attend our kiln openings and have first pick of the pots as we take them out of the kiln, then email us at oldcanalpottery@yahoo.com and we’ll put you on the list. Though the kiln has now been fired and adusted 3 times, the fourth firing took us to where we wanted to be. 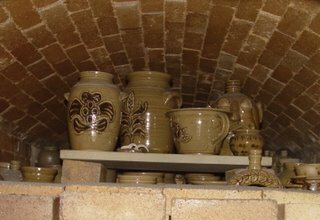 The pots took one day to set in the kiln. A small fire was started at 11:00 am on Saturday September 9, 2006. It was slowly increased in size and intenisty over the next 9 hours where upon it resembled a large campfire in size. Sarah Barton then came on-board to help me with taking it to the finishing temeratures. The kiln climbed smoothly over the next hours with the #11 cone dropping at about 4:00 am the following day. 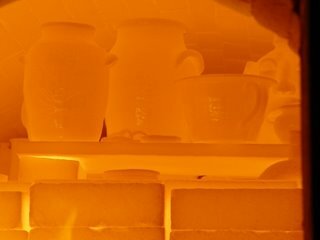 The kiln maintained a steady climb and stayed in perfect balance exhibiting rapid pulsing or puffing around the firebox door. After the #11 cone had dropped, the kiln was blasted off for another hour and a half to ensure the back reached at least a cone 7. 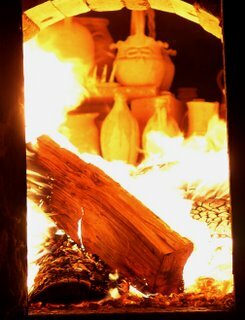 With the help of some remarkable old heart pine wood scrap, the entire firing was complete in under 20 hours.I’m posting some other photos of the firing as well as some constuction pics. I’m stoking and carefully standing behind the door. The heat is incredible anytime the door is open and will render your legs hairless and as smooth as a baby’s bottom! 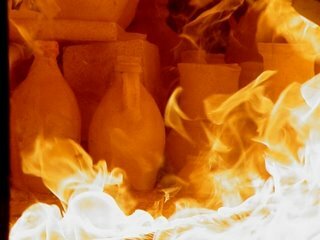 Some rolling fire working magic on pots. Another view through the door. 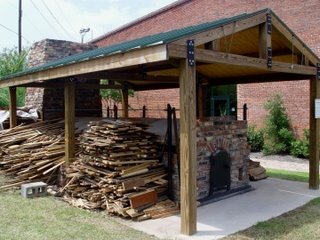 The split oak logs are used for preheating and bringing the kiln up to a bright orange heat. 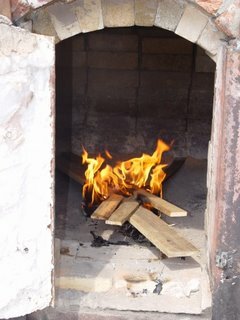 This is a left-hand side view of the kiln showing some of the primo heart pine scrap used for blasting the kiln to the final temperature. It’s truly wicked stuff! Thanks to Benny Christian from Christian Millwork! 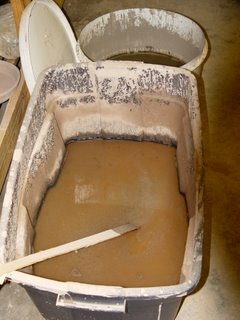 This is a vat of the ash glaze used on the raw pots. It’s ash content makes it very caustic and hard on the hands! Jergens just go on home. 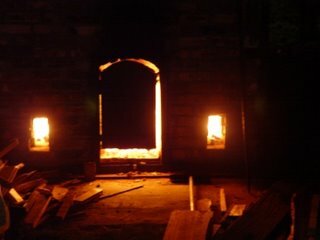 Sarah was checking the rear of the kiln to see what color the flames were as they came into the chimney. Starting a small fire at 11:00 am. It has to be a long, slow climb from this or pots will explode and other woes will creep in. Inside studio. One of the drying racks is in the background and my workbench is in the foreground. Check out Gene’s beautiful orchid! On the way to kiln. I love these little carts! I think I’ll spiff it up with some dividers and sides as well as some period colors on the cast iron fittings and wheels. 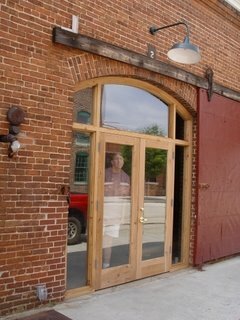 Gene looking out studio door. 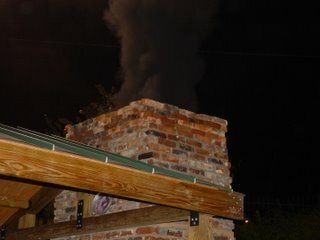 Heavy smoke from blasting off kiln. Actually, the smoke is just starting. It forms huge clouds of thick, black, tar-like smoke for a miute or two followed by an orange flame that shoots up and out of chimney. These blasting cycles go on for an hour and a half, typically. Setting the kiln. This takes two persons. Usually, someone is on the outside placing pots on a long plank that is slid in to me on the inside to set. The buttocks and hamstrings get incredibly sore for a day or two after crawling around. Pots cooling down after dropping cone 11. You can see the cone plaque with numbers 8-10-11 laying flat. It was blasted some good licks after the 11 cone fell to ensure the rear of the kiln reached a suitable temp. 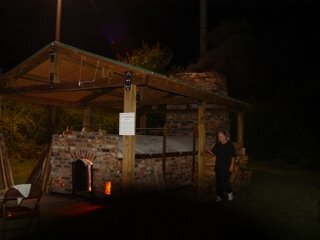 Late night shot of the business end of kiln at full heat. This scene gets real mesmerizing after 7 or 8 hours of staring at the bright light in the darkness of night. You stumble like a crazed zombie looking for the next chunk of wood to throw in. 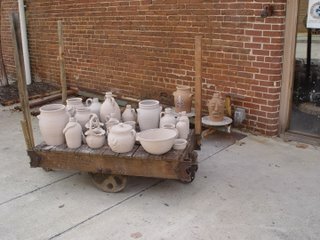 Stan hauls some pots to kiln. Thanks! Notice the railroad tracks that run by the studio to the kiln. This is where some of the world’s finest cotton cloth was shipped out from Enterprise Mill in its former life. Here I am peeking out. 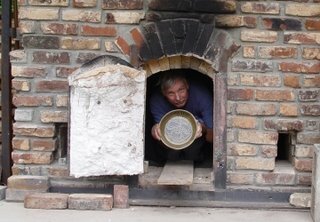 Now you see why it’s called a groundhog kiln. 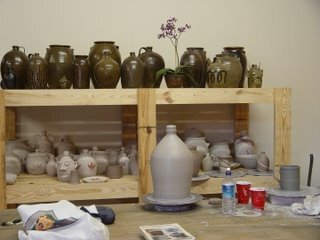 Some of the fired pots back in the studio. Hi Gary..it is Lorri! Please visit my photography website, fotografairehttp://www.fotografaire.comMaybe we can link to each other? ?I look forward to seeing more from you.